Family Resources - Fitting Shoes "Your Best Friend"
A well-fitted shoe can be your best friend. Wearing comfortable well-fitting shoes can make walking enjoyable and prevent falls. Ill-fitting shoes can increase discomfort from bunions, corns, calluses, hammertoes and other foot problems thus limiting activity. In addition pain can cause you to alter the pattern of your gait and this can affect your balance. All of these factors put you at greater risk of falling. So how do you choose your new “best friend”? If you notice a pattern of wear on the inner or outer soles this may indicate that your foot turns in or out and an orthotic insert may help. If you notice toe-shaped ridges on the top of the shoe this may indicate that the shoes are too small or you have hammertoes in which case a shoe with a roomy fit (box rather than point style) may be a better fit. If you notice a bulge and wear on the side of the big toe this may indicate that you need a wider shoe to fit around a bunion. Or you can modify the shoe by cutting an area out over the bunion. Evaluate a shoe by fit rather than size. Choose soles that are non-skid but ensure that they have enough glide so that your feet aren’t sticking to the floor. 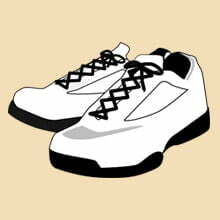 Shoes that flex in the middle are preferable to a stiff shoe (if you are feeling like you are walking on “planks” the shoe is stiff). Choose a shoe that fits your lifestyle. If you are an active walker you will need a supportive shoe. Velcro fasteners are easier to manage but lace-up shoes allow for more expansion if your feet swell during the day. Ensure that you also have comfortable supportive slippers for times when you are not as active but may need to take that brisk walk to the bathroom. The ideal slipper is like a soft shoe. Avoid open back slip ons as these are easy to slip out of. A Velcro flap closure will allow you to easily adjust the fit so that the slipper is snug. Choose a non skid sole just incase your walk to the bathroom was not as brisk as you had hoped! Take care of your feet and they will take care of you; an old adage but ever so true.